Birth control pills are not only a form of contraceptive for women—they also provide additional benefits for the user. Many women use birth control pills to control their period, either to regulate when their period happens, have a lighter period or preventing a period from occurring every month. One effect the birth control pill has on a woman's period is regulation. A woman's menstrual cycle is on a 28 day schedule, with her menstruation lasting for three to five days; however, the menstrual cycle can range from 21 days to 35 days for adult women who do not use birth control, according to the US Department of Health and Human Services. 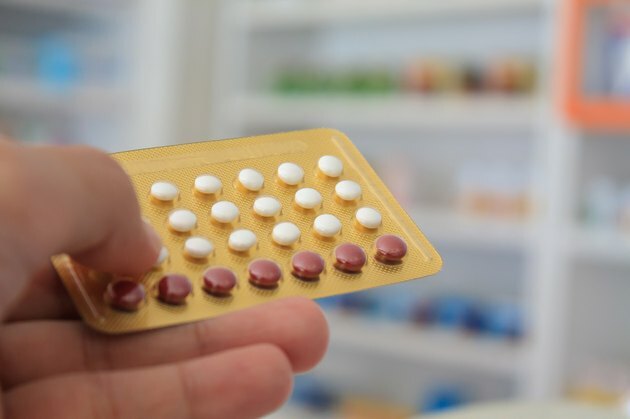 The Mayo Clinic states that birth control pill packs have three weeks of hormone pills, followed by a week of placebo pills. During the week of placebo pills, a woman will get her period. Women who have irregular periods may benefit from the birth control pills' period regulation. In addition, birth control pills can change when a woman's period will occur. If a woman has an important event coming up when she would normally have her period, she can choose to take a week of hormone pills instead of the placebo pills. Then, she would take the placebo pills the following week. Birth control pills can also affect the woman's menstrual flow, according to Epigee.com. One type of birth control, Yaz, has only four placebo pills; as a result, women who use Yaz have shorter and lighter periods. The birth control pills can also reduce premenstrual symptoms, like cramping. When a woman starts to use birth control, she may experience spotty bleeding, either during her period or in between periods. Another reason women choose certain brands of birth control is to not have any periods. The Mayo Clinic notes two types of birth control pills that offer this effect on a woman's period: Lybel and Seasonale/Seasonique. Both types of these pills are continuous birth control pills, meaning placebo pills are not used every month. Lybrel is a yearly continuous birth control pill—no placebo pills break up the pack. Seasonale and Seasonique, on the other hand, are 91 day pill packs: women have only four periods a year, so only four months' packs have placebo pills. The same effect can be achieved with 28 day pill packs if the placebo pills are not taken.